WHAT’S UP WITH SKINNY BEE XTREME? PLEASE NOTE AS OF 11/19/18 WE ARE SWITCHING BACK TO THE ORIGINAL ORANGE CAPSULES WHICH IS A STRONGER BLEND PER CAPSULE/DOSE. PLEASE READ THE DIRECTIONS ON THE BOTTLE FOR THE UPDATE. Elite Weight Loss Skinny Bee Pills Xtreme formula is the most Xtreme appetite suppressant helping you decide when to eat, instead if mindless snacking and curbing those unwanted food cravings, and help you to feel fuller longer. Skinny Bee Xtreme can be the best asset to your weight loss regimen without a dramatic diet or countless hours exercising on any fitness program. Skinny Bee Xtreme will boost your thermogenic cycle, your built in metabolism to burn calories 24/7. Skinny Bee Xtreme is an excellent fat burning supplement to lose belly fat fast. Skinny Bee Xtreme is exclusively formulated to assist you in the transformation and reshaping of your body for dramatic weight loss results. 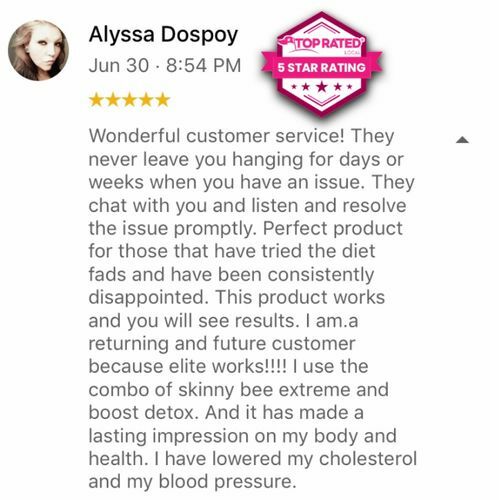 Made with the industry’s top ingredients to help jumpstart your weight loss journey, or when it’s time to switch up from one of our other amazing Elite Weight Loss products, Skinny Bee Xtreme will simply not disappoint! 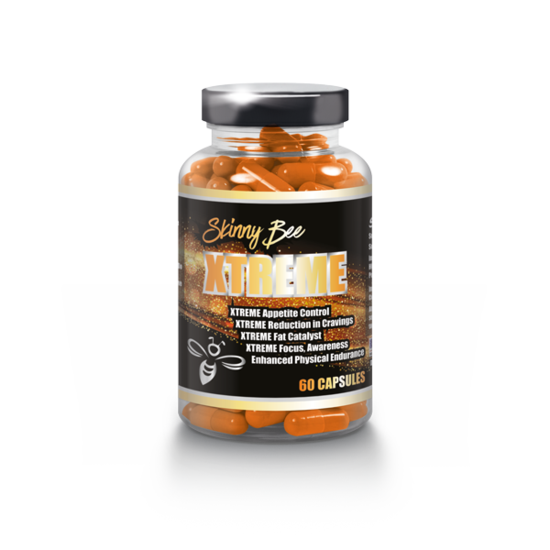 A key component in Skinny Bee Xtreme Is the Lecithin in the bee pollen, which simply works as a fat catalyst, stimulating the skinny bee xtreme metabolic process. This is a component of bile that is produced in the gallbladder to digest and flush fats from stomach, hips, thighs and arms. Skinny Bee Xtreme is just another one of Elite Weight Loss’s top Bee Pollen for Weight loss dietary supplements to help you get healthy and the skinny results you are looking for. Contains Yohimbine HCL, L-Carnitine L-Tartrate, B-Phenylethylamine, Caffeine, Bee Pollen, Hordenine HCL. Inactive ingredients:Gelatin (capsule), Cellulose, Magnesium Stearate, Silica. 986.25 MG PER DOSE, 2 CAPSULES PER DAY 30 SERVINGS PER BOTTLE. Skinny Bee Xtreme Vitamin and diet supplements are made in the USA. Skinny Bee Xtreme is not available in vitamin and supplements stores, they are only available through our authorized retailers and distributors.